Dark Satin Brushed HSS Strat Stainless Steel Guard, with matching screws. 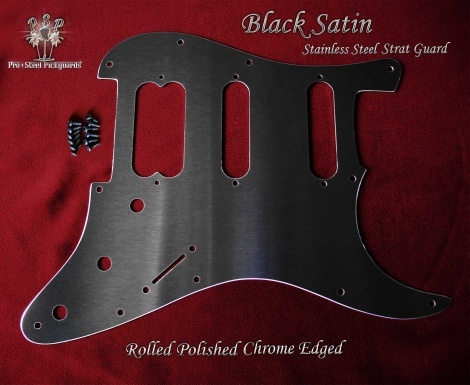 Matching Strat Backplate by request. A larger choice of Dark Guards is now available. Please check the list below. Shipped with dark stainless steel screws, to match the guard. Dark Brushed Stainless Steel with a silver lining. It's a smart finish which naturally happens after all edges are rolled & polished, including the pickup slots. With matching dark polished screws to complete the hand finished details. Tasty for that Strat needing a special dark guard. 100% stainless steel permanent electro bath color, no paint. This hand brushed effect has a dark slate metallic gleam to the finish. Giving a little more natural and organic look to the medium brush texture. It has an unmistakable classy metal shimmer when compared side by side to the duller similar color of a dark anodized aluminium guard. NOTE: There may be some slight wear & fine scratching patina to the surface after an extended time of use, or with aggressive playing styles. Light weight, very rigid, only 0.9mm thick, weighs just under 2 plastic guards. Squier Strats etc: Will fit current Squiers. If older than '86 there maybe 1 or 2 screw holes a little off center. That's usually no problem, the screws supplied will easily find a hole. Epiphone G-400 Toggle Switch Cap.